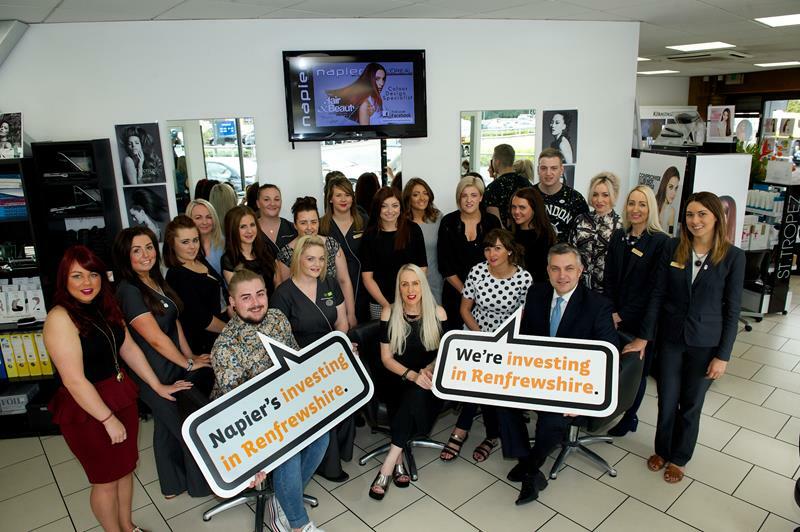 The team at Paisley’s Napier Hair and Beauty lined up with Councillor Mark Macmillan, Leader of Renfrewshire Council to applaud the work of the Invest in Renfrewshire partnership and to celebrate the salon’s successes in staff training and development. The business support and employability partnership has, in three years, worked with almost 800 businesses and found work and training opportunities for nearly 3000 residents. Owner, Elaine Napier, started working closely with the team at Invest in 2013. Since then, she has been able to boost the salon’s training budget, find staff and create new positions with support from the programme. In the true spirit of Invest, Elaine has also worked with Renfrewshire’s young job seekers delivering industry awareness sessions. She is also getting ready to offer hairdressing skills training to young people– even if they do not work at Napier. She said” Invest is helping Napier a lot. It is vital that our staff are trained to the highest standards and that we can offer them long term and fulfilling careers. Everyone benefits from this approach and Invest has helped with staff recruitment, training and retention. “Just as importantly, Invest is also helping trades and professions locally by encouraging training, linking young people to career opportunities and supporting the town’s business community. Elaine Napier’s belief in staff development is paying off. Now a stylist with the salon, Reece Phimister won The Scottish Training Federation’s Modern Apprentice of the Year, was third in the Glasgow Trades House Awards and came Runner-up in the Renfrewshire Employability Awards. The salon has alsao just recruited Paisley resident, Toni Gallagher, who will train a hair spa specialist to add a further dimension to Napier’s customer service. Businesses interested in joining the Invest in Renfrewshire partnership to find support for their growth, employ new staff, contribute to the local economy and connect with other entrepreneurs, should call 0300 300 0144.